O Cross of Christ, our only hope! So runs the Church's hymn for the final days of the Lenten season, the Vexilla Regis. Traditionally, this hymn was used throughout the season of Passion-tide, which extended through the final two weeks of Lent. Now it is used only during Holy Week, calling to mind the Passion and death of our Savior. As the season of Lent comes to a close, we are invited to meditate more intensely on the centrality of the Cross in the mystery of salvation. This is expressed most dramatically when, on Good Friday, the faithful come before an image of the Cross and, genuflecting before it, venerate the image with a kiss--a most intimate sign of devotion and love. 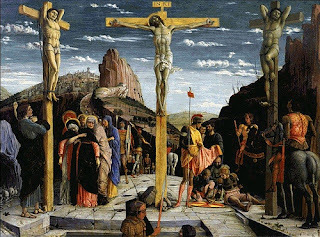 St. Thomas Aquinas offers a most profound and insightful commentary on the devotion we ought to have for the Cross when, in the tertia pars of the Summa Theologica, he asks "Whether Christ's Cross should be worshiped with the Adoration of Latria?" (ST III, q.25, a.4) Here, the Universal Doctor invokes the above strophe of the Vexilla Regis and comments: "We show the worship of latria to that in which we place our hope of salvation. 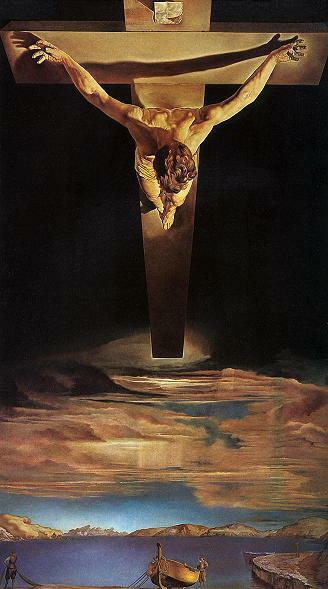 But we place our hope in Christ's Cross, for so the Church sings: O Crux, ave, spes unica...Therefore, Christ's Cross should be worshiped with the adoration of latria." St. Thomas Aquinas maintains that, while Christ suffered the most intense sorrow and pain in the Passion, he nevertheless experienced also the greatest joy of beatitude trough the beatific vision (ST III, q.46, a.8). Indeed, while it is impossible for a man to be both happy and sorrowful at the same time about the same thing, it is not impossible that one should be happy on one account and sorrowful on another even at the same time. Moreover, the beatitude of Christ’s soul actually increased the sorrow and pain which he suffered. For Christ was sorrowful at the sins of men and he knew these sins most perfectly through the beatific vision and infused knowledge—thus, upon the Cross, Christ knew each sin which had ever or would ever be committed and he knew who would abandon him and how many would die in mortal sin rather than receive his grace; and all of this caused the greatest sorrow in his soul. Again, the beatitude of Christ’s soul increased the physical pain which he suffered, since his physical senses were most perfect and in no way dulled by sin. Summa Theologicae III, q.46, a.5. Whether Christ endured all sufferings? Human sufferings may be considered under two aspects. First of all, specifically, and in this way it was not necessary for Christ to endure them all, since many are mutually exclusive, as burning and drowning; for we are dealing now with sufferings inflicted from without, since it was not beseeming for Him to endure those arising from within, such as bodily ailments, as already stated (Q. 14, A. 4). But, speaking generically, He did endure every human suffering. This admits of a threefold acceptance. First of all, on the part of men: for He endured something from Gentiles and from Jews; from men and from women, as is clear from the women servants who accused Peter. He suffered from the rulers, from their servants and from the mob, according to Ps. 2:1, 2: "Why have the Gentiles raged, and the people devised vain things? The kings of the earth stood up, and the princes met together, against the Lord and against His Christ." 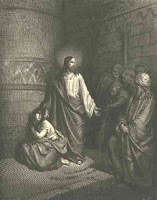 He suffered from friends and acquaintances, as is manifest from Judas betraying and Peter denying Him. In His Holiness’ most recent Wednesday Audience of 17 March 2010, Pope Benedict XVI continued his reflections on St. Bonaventure. 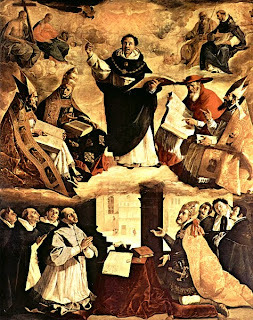 In this, his third reflection on the Seraphic Doctor, Pope Benedict presented St. Bonaventure in conjunction with his contemporary, the Universal Doctor, St. Thomas Aquinas. 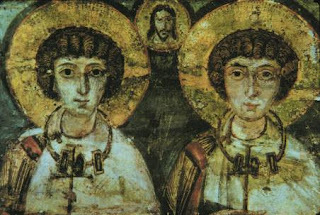 Affirming that each of these medieval Masters contributed much to the development of the Church’s theological tradition, the Holy Father also points out a significant difference between the two theologians. “A first difference concerns the concept of theology.” Pope Benedict stated, “Both doctors asked themselves if theology is a practical or a theoretical, speculative science. Sometimes in the American Catholic world, there unfortunately can exist a certain attitude that is suspicious of leisurely activity, even of the most wholesome sort. This suspicion often rears its ugly head in the form of virulent opposition to competitive sports. The games, the argument goes, only distract us from what is really important. At the heart of this view is the notion that the difficult and the good are coterminous. If I'm having fun, therefore, there must be something wrong with what I am doing. For those faced with this Puritanical opposition to sport during this greatest of sporting weeks, we present the philosophical work in defense of sports of the great Father James V. Schall, S.J., Professor of Government at Georgetown University and long-time sports fan. Thus, in our fascination at watching a game, in reading about one, we have at least one example of something that clearly need not exist, but which, when it does, fascinates us. Games are not necessary. They are not for something else, like exercise. Can we not wonder on this basis, then, whether perhaps the higher, more serious things, such as the players themselves, also need not have existed, but when they do, they consume our attention, because of the stakes, the risk? Since we can cheat and fail, we know that in the highest things we are serious, as Aristotle seemed to have implied. Here, in a way, we near what is best in ourselves, for we are spectators not for any selfish reason, not for anything we might get out of the game, money or exercise or glory, but just because the game is there and we lose ourselves in its playing, either as players or spectators. This not only should remind us that we are not sufficient unto ourselves, but that what is higher than we are, what is ultimately serious, is itself fascinating and joyful. “They said this to test him, so that they could have some charge to bring against him.”—The scribes and Pharisees thought to accuse him of being opposed to the Law if Christ should forgive the woman, or, if he should order her to be stoned, they would accuse the Lord of being cruel and harsh. But they presumed Christ would forgive her as St. Augustine says, “They saw that he was very gentle; they said therefore among themselves, ‘If he rules that she be let god, he will not observe that righteousness which the Law enjoins. But not to lose his (character for) gentleness, by which he has already won the love of the people, he will say that she ought to be released. 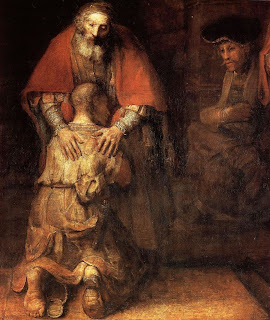 And we shall find occasion to accuse him.’ But the Lord in his answer both observed justice and did not forego his gentleness” (Cornelius a’ Lapide, Commentary on John). The video below from RomeReports highlights a recent conference at the Pontifical University of the Holy Cross in Rome, at which the topic of discussion was the apostolic roots of clerical continence and celibacy. The key here is that, even when clerics were married (like many of the Apostles, for example), they remained continent (i.e. they abstained from sexual relations) after ordination. This discipline still pertains today, according to Canon 277 of the Code of Canon Law, as leading canonists Dr. Edward Peters and Fr. Brian van Hove, S.J. have recently shown. Peters's article in Studia Canonica is particularly helpful in addressing this matter in a way that is both theological and pastoral. The reason for the discipline of continence for sacred ministers has to do with the long-standing Judeo-Christian connection between abstinence from sexual relations and the offering of sacrifice. Because the one who offers sacrifice (and those who assist him - like the deacon) speaks for the whole community before God, he must be free of any exclusivity in his relations. He is not just for his wife, but is for the whole community. This is why he abstains from sexual relations, even if he is married. The higher calling to worship demands that he sacrifice the great good of marital intimacy. This is, of course, no slur against marriage or the marital act. Rather, it is a recognition that, with sacred ordination, this man has been re-configured and totally consecrated as a public person to the duty of public worship. He is now completely a "man for others," as Pope John Paul II often said. For this reason, he gives up the great good of marital intimacy so as to be able to stand before God on behalf of the whole community. On Monday, March 8, the Church celebrated, in the extraordinary form of the Roman Rite, according to the traditional Roman calendar, the Feast of St. Thomas Aquinas. The feast was transferred this year from March 7 (the date of Thomas's death) due to that date's falling on the Third Sunday of Lent. As mandated by Pope Pius XI in Studiorum Ducem, in schools or seminaries, this feast is to be celebrated with great festivity (as a first-class feast). At one seminary, a private Solemn High Mass was organized and celebrated, with about 20 students and faculty in attendance. The following is the text of the sermon preached at that Mass. The images of salt and light, used by Our Lord in our Gospel today, are particularly apt descriptors for the savor and radiance of the doctrine and example of Thomas Aquinas. Above all other doctors, the Universal Doctor stands out as the chosen instrument of the Lord, providing, in the order of sacred doctrine, the purest salt for the earth and the most brilliant light for the world. “His son said to him, ‘Father, I have sinned against heaven and against you; I no longer deserve to be called your son.’ [But his father said,] ‘Let us celebrate with a feast, because this son of mine was dead, and has come to life again; he was lost, and has been found.’”—By this we see that contrition must lead to confession of sin, which sin is forgiven by divine absolution. Penance, as a sacrament, is composed of matter and form. The matter of this sacrament is nothing less than the contrition and confession of the penitent (sins being the remote matter). 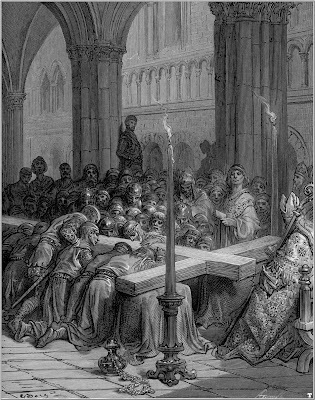 The form is the absolution granted by the priest (ST III, q.84, a.1, ad 2). We will consider the matter supplied by the penitent. In this regard, penance is twofold, external and internal. Internal penance is that by which one grieves for a sin one has committed. As man should always be displeased at having sinned, so man should experience some sorrow for his past sins throughout his whole life, even after they have been sacramentally absolved (ST III, q.84, a.8). This sorrow need not always be in act, but should at least be an habitual sorrow for sin and a resolve to avoid future sin (ST III, q.84, a.9). External penance is that by which a man shows external signs of sorrow for sin, confesses his sins to a priest and makes satisfaction (ST III, q.84, a.8).